Over the past couple of days there has been a conference in San Fransisco run by the Wall Street Journal called D7 (you can find out more bout D7 here). This conference brings out some of the top tech players like Microsoft, RIM (makers of the BlackBerry’s), and Palm, and while usually it is just “CEO talk” about their thoughts on the tech market and such, sometimes, these CEOs reveal info on new products. The other day, Palm was one of those companies, releasing a whole bunch of new info on the previously very secretive Pre. For a video of Palm’s demonstration see here, and for a full press release of the new features see here. In other Pre news, while Sprint will be launching the phone, Verizon AND AT&T have both said they want the Pre, and are said to be getting it by the end of the year (Verizon’s CEO, for example, said that the Pre and the BlackBerry Storm 2 — which we’ll get to in another post — will be coming within 6 months!). Palm wouldn’t confirm this, as not to jeopardize their relationship with Sprint and the launch of the Pre next week, but this is definitely great news for AT&T and Verizon customers, and definitely not the news Sprint wants to be hearing right now. Still no word on 4G on the Sprint Pre, though we should find out though if that rumor is true when the Pre comes out next week. Anyway, what are your thoughts? You like iTunes and Pre working together- will this sway you to get a Pre as it is now even more iPhone like? What do you think Apple’s reaction will be to all this? And with news of AT&T and Verizon getting Pre (or Pre-like devices, like the Eos rumored for AT&T), if you were leaning toward buying the Pre on Sprint are you now inclined to hold off? We are interested in your opinions, so sound off in the comments. Next month, a major video game conference called E3 is taking place, and all the big players in the video game industry– Nintendo, Microsoft and Sony, will be there. A lot of new/upcoming games and accessories usually get shown off for the first time as well. Read on to see of the rumors that have been flying around for E3 this year. Netbook vs. Notebooks: Which to Choose? For the last couple of weeks, Intel kindly included us in a project to compare netbooks and traditional notebooks (aka regular laptops). So during that time, we put the Dell Inspiron Mini 9 netbook and a Dell Studio 15 traditional laptop through their paces, especially in areas crucial to the daily computer needs of teens. We tested them out doing everything we could think of: Facebook, note taking, IMing, some internet gaming, viewing videos, playing music, and so on. The comparison was quite interesting and if you’re considering computer purchase in the near future, we strongly advise you keep reading – it’s very likely you’ll want one of these types of computers (netbook or notebook/regular laptop). Remember the cool, update to the very, very popular Samsung Alias we wrote about in our upcoming Verizon phones post? Well, today we got some good news for those interested (and we assume a lot of you heavy texters out there are). According to the Boy Genius Report, the Alias 2 is confirmed to be coming to Verizon on May 11th for the AMAZINGLY AWESOME price of only $79 on a 2 year contract. Now at first glance it looks like the same old Alias with a dual flip design where you flipped the phone up normally and had a normal keyboard, or flipped it up on its side and had a full QWERTY keyboard for texting, and you probably are thinking right now: “ok, so what’s new here that I should actually give a hoot?” Well, if you recall the first Alias had both styles of the keys (QWERTY letter and regular phone number and 3 letters) all on one key, making it really small and sometimes hard to tell what key was which. With the Alias 2 you can kiss that problem good bye as Verizon is throwing in a “magic keypad”: quite similiar to the tech on T-Mobile’s Motorola Rokr E8 and ZN5, the letters and the numbers on the keys change to what you are using it for (i.e. 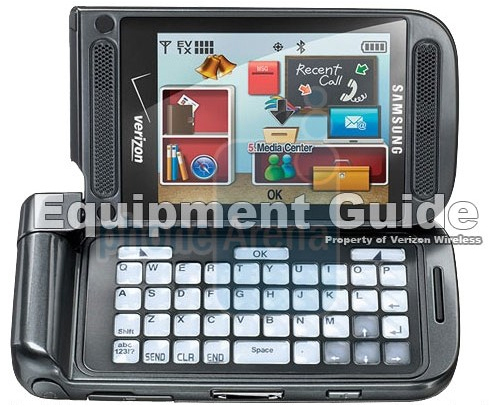 looking like a real phone keypad for calling, or a regular QWERTY keyboard if your texting, with no combination of different types of letters on the same key). It gets even better, as unlike the Rokr and ZN5’s keypads’, which weren’t really individual keys, each key on the Alias’s 2 keyboard has it’s own E-INK (aka electronic ink, the stuff found in e-books like the Amazon Kindle which are low power black and white screens), which means even better texting!